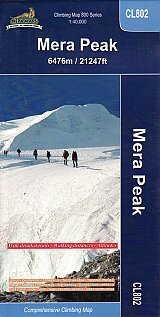 A detailed 1:30,000 scale map which covers trekking to the Top of Mera Peak. The route is a very strenous 14 days going via, Lukla, Chutanga, Zatrwala, Thuli Kharja, Tashing, Ongma, Mosom Kharka, Thangnak. Dig khare, Khare Camp, Merala, Base Camp, High Camp, Mera Central Summit, Mera North Summit, Lukla.